Employee TSGLI Slips #TSGLI Annual Account Slips, Know Your Policy Details, Policy Number/ Employees can Know Your #TSGLI Policy Details from the following details, Download the TSGLI Annual #AccountSlips, Know your #PolicyNumber by using Policy No. 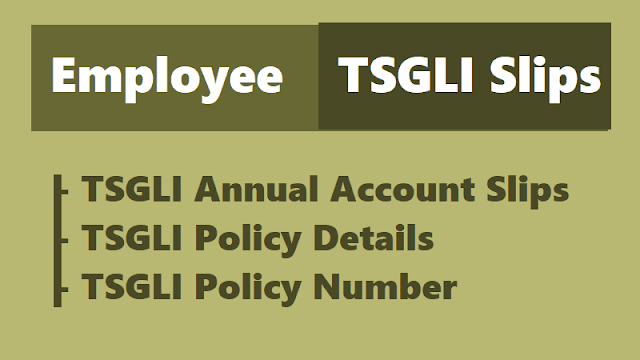 Search option, Know your TSGLI Policy Status using with Policy Status. #TSGLI Slips: TSGLI important links are provided here. These link are useful to teachers. Step 1. Please enter your correct Policy number. Step 2. Select the financial year. Step 3. Please Enter The number Generated in the Image. Step 4. Click the button "View Report". Step 1. Enter Your Policy number. Step 2. Enter Your Date of Birth. Step 4. Click the button "View Details". Step 1. Enter part of Name. For example Chandra for Chandrasekhar. Step 2. Enter part of Father's Name. Step 3. Enter the Date of Birth. Step 4. Please Enter The number Generated in the Image. 5. Click the button "Retrive PolicyNo." Step 1. Please enter your correct Policy number. 2. Enter Applicant Name. Step 4. Select the financial year. Step 5. Please Enter The number Generated in the Image. - Total Amount of TSGLI schedule attested by the DDO. 2. In Case of challan remittance, the subscriber has to submit the places of posting with the deduction particulars such as month, amount of Premium / Loan Instalment, Challan number, Challan amount and date attested by DDO, along with full details of Policy numbers and names of the employees for whom the challan is paid. The Drawing Officers have to verify the correctness of the TSGLI policy numbers in the schedule with reference to the policy bonds issued by the Department. If wrong Policy numbers are quoted in the schedules, the premium cannot be posted to the individual accounts and missing credits will arise. The correct policy numbers once recorded in the schedules should not be changed every month. The employees also have to verify the correctness of their policy numbers mentioned in the monthly schedule at least once in a year. The policy number may be recorded in the first page of SErvice Register(SR) of the employees as a permanent record.